A tribal song plays quietly on a cell phone plugged into an inverter drawing power from a solar battery on a mud platform under the thatch of Champa Lohar’s hut in Kotpit village. In this cluster of forest villages in the Rairangpur block of India’s eastern Odisha state, most adults have cell phones, despite there being no service network and no grid power supply to charge the handsets. “This will eat away into the battery life – how many times have I told you not to misuse the solar set,” admonished Sunil Chandra Nayak, who runs a radio-repair shop and provides maintenance services under a government scheme to boost energy access in remote areas. In India, an estimated 364 million people live without access to electricity. The national off-grid Remote Village Electrification Programme (RVEP) covered over 8,000 remote locations from 2003-2012, around 95 percent of these with solar systems. But many villagers use the solar batteries given to them by the scheme to charge phones and run electrical equipment other than the lights they are supposed to power. In 2010, 45-year-old Lohar and her family of six received two 9-watt compact fluorescent lamps (CFLs) powered by a 12-volt solar battery that can provide four to five hours of light. Some 61,000 poorer households in 950 rural settlements in Odisha – where grid connectivity is either not feasible or cost-effective – also got lamps, a battery and a solar panel. Many of those who have benefited from the RVEP say they are happy with the lights, which enable children to study and adults to supplement their incomes. “I run a cycle repair shop and a tiny food shop, open till early evening using one light. For an hour after, I use the light to stitch kantha (thin floor mattresses made from discarded clothes),” said 35-year-old Jaipal Hembrum of Kautuka village. Hembrum earns 200 rupees ($4) a day from sewing up to five kanthas, and is trying to set aside money for the weddings of his three daughters, the eldest of whom is only eight. “The 550 rupees ($10) we save yearly from not having to buy kerosene for lamps is equivalent to the cost of a sack of paddy and feeds our small family for 25 days,” said Budhni Sardar, as the younger of her two children suckled on her lap. But the scheme is not without its problems, including misuse of the solar kits. Lohar and her husband earn good money – 1,200 rupees ($22) per week – breaking iron ore at the nearby hill quarry. But it’s hard work, and she wants to relax in the evenings watching films on DVD. But the family complains their solar battery provides only enough power to watch one hour each day, and then only in black and white. The Lohars’ alternative use of their solar power system is nothing compared to the mikes that blare across villages on festive occasions, weddings and weekly market days. These run off the RVEP’s 75-watt/hour batteries intended for solar street lights, prised out of their metal boxes. “The charge control box that controls and indicates battery health is the first casualty,” said Alok Bhoi, a technical assistant in Mayurbhanj district for the public-sector enterprise Central Electronics Limited (CEL), which installs and maintains RVEP systems in Odisha. Appliances are then connected via inverters to the battery, which depletes faster and hits the minimum discharge floor. This often leaves the battery unable to accept a solar charge without an electrical top-up, for which it has to be taken to Rairangpur, the nearest town 30 km away, Bhoi explained. But local entrepreneurs who encourage abuse of the RVEP solar units are thriving. “In Keojhar district’s rural weekly markets, inverters are openly stacked up in attractive pyramids; in Rairangpur town, computer repair shops will put electronic chips preloaded with local dialect songs into mobile phones,” said Bhoi. A state official said only one in ten houses misuse the solar batteries. But five out of every ten households Thomson Reuters Foundation visited were charging mobile phones with them, while at least three in ten ran TV sets. Charging a mobile phone uses up more than one hour of battery power, leaving only three hours for the home lights. “Rural communities’ demands and aspirations are higher than we assume,” said Ashok Kumar Choudhury, a senior official at the Odisha Renewable Energy Development Agency (OREDA), which implements the RVEP in the state. The more serious concern is keeping the equipment in good condition. Less than 10 percent of RVEP villages visited by Thomson Reuters Foundation had the knowledge and tools needed to maintain their lights after a five-year free service period ends. Most villages were electrified in 2010, meaning free repairs and replacement will continue for only two more years. The Village Energy Management Committees (VEMC) – selected by local people to administer the scheme – are defunct in many places. Communities seem to have lost faith in the VEMC leaders because they have bungled the collection and management of household fees. Under the system, the VEMC should open a bank account with initial installation deposits of 120 rupees ($2.3) handed over by each household. OREDA’s permission is required to use the funds. At monthly meetings, a further 20 rupees ($ 0.4) is collected per household, while any grievances are addressed. William Bilung, OREDA’s chief executive officer, said the aim was for villages to be able to buy replacement equipment after the initial five years. A home lighting system costs 11,000 rupees ($185) today, down from 15,000 rupees ($250) in 2006. 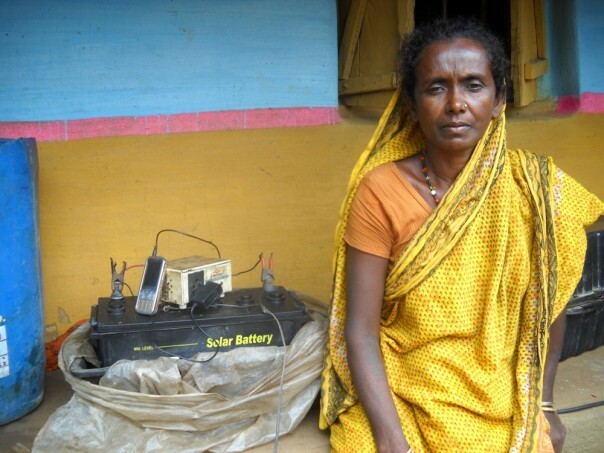 A solar battery costs 4,000 rupees ($65) – a price beyond the reach of most poor households on a one-off basis. Rairangpur block repairman Nayak said OREDA had asked him to collect bank account details from 13 VEMCs in 2012 and check deposit amounts. He found that seven had not even opened accounts. Kotpit’s VEMC president Hajam Murmu admitted to this, saying he had kept the 16,000 rupees ($270) collected in 2010 and 2011 safe at home. Villagers have neither attended monthly meetings nor deposited their fees since 2012. Balikani village school teacher and VEMC president Jenaram Pingua collected community deposits for the first year only. “Villagers said ‘why should our money be used for someone else; we will use our own money if the need arises’,” he said. The VEMC account contains 4,000 rupees ($65), he added, but when asked to produce the bank book, he said it was being updated by someone in another village. In Kautuka village, VEMC president Biaju Hasta said no bank account had been opened and the entire 7,000 rupees collected in 2010 had been used to officially register the village football team so it could participate in local tournaments, possibly paid in the form of a bribe. Monthly meetings there are also petering out, shutting off a critical forum for registering complaints and needed repairs. Seven out of ten households visited had major or minor problems with their solar units that had not been attended to. A few street lights that stopped working five to seven months ago had been dismantled and stowed away, without being sent for free replacement. “Community responsibility is nobody’s responsibility,” rued OREDA official Choudhury. But local people insisted they would be willing to pay the monthly deposit if there were greater transparency around how the money is used. Presently there are 80,000 un-electrified villages in India, of which 18,000 are remote. The 12thFive Year Plan, which runs from 2012 to 2017, proposes that the RVEP should change its name to the Village Lighting Programme and expand to include villages where electricity is available less than six hours a day. If this happens, each household would receive two 9-watt lamps and a 40-watt solar-powered wall socket, which can be used to charge a mobile phone and run other household appliances.